When we hear the word fountain we often imagine a floral spray pattern or statuesque columns rising high into the air over ponds and lakes but a fountain can also be a smaller decorative water feature that is nestled into even the smallest backyards or on patios. Garden fountains come in a variety of shapes and made from a variety of materials from fiberglass compositesthat look like hewn metals to real basalt stone pillars carved from huge stone formations. They can be playful and cute, or modern or classic in styling, with a wide range of sizes and at price points that make it possible for everyone to find something to add the calming beauty of water and sculpture to a garden. Birds will come and drink from the fountains and they can make a dramatic focal point just as easily as they can add a touch of whomsical magic. There are fountains that feature cute creatures as well as the more traditional bowls, pots and bassins. Of course it is alsofairly easy to create your own garden fountain with a pump and materials on-hand if you feel like a do-it-yourself project but if not then take a look at these ornamental water features for gardens and landscapes. Chic and dramatic colored water jets are easily created with the OASE™® Water Jet Lightning fountain system. Luminous, colored, water arches are shot from sleek adjustable jets that offer LED lighting variations that make the water jets literally glow from within. This easy-to-install, all-inclus.. 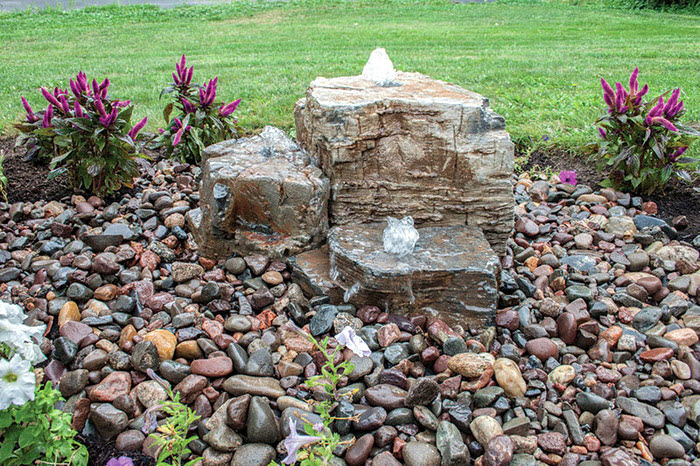 The complete Pagoda Fountain Rock Kit is a complete package that includes everything you need to create an amazing decorative fountain in your yard or deck area. Includes 3-piece Pagoda Rocks each of a different size, a large fountain basin, a 2000 GPH Ultra pump, three fountain light with t..
Aquascape's Aquatic Patio Planter makes it simple to have a complete water garden in almost any setting. If you have ever tried to make a traditional ceramic or stone bowl into a container water garden, you know how difficult or costly it can be to add plants without shelves. Aquascape's Aquatic .. Ideal for small pondless waterfeatures or in ponds and pools, the Quintet fountain features five adjustable water jets clustered together in an easy to install compact system to fit in almost any landscape and provide a fanciful dancing fountain pattern with minimal splash and maximum visual impa..
Fountain nozzles included. Pond pump with multiple fountain heads ideal for small ponds. Create an inexpensive pond display! The SyncraPond™ series of pond fountains is a filter-pump ideal for small water gardens and small outdoor ponds. Create lovely fountain displays in your smal..
Pond spitters add a decorative touch to a pond or water garden. Formal stauesque spitters or more playfull designs are available. Each spitter comes inclusive with a small pump so they are easy to add to any pond! Playfull frogs, naughty dogs, elegant crane spitters as well as bamboo fountains an..
Self-contained water and fire features have been gaining in popularity over the last few years. Aquascape®, always the innovator, decided to add the beauty and elegance of fire to one of our GFRC or glass fiber reinforced concrete water features. The self-contained feature is a simple plug-.. The Aquascape Spillway Bowl, Basin and Stand allows for an unlimited amount of installation possibilities. The Aquascape Spillway Bowl and Basin can be installed as a standalone disappearing water feature, or several spillway bowls can be linked together for an amazing display. Made from .. Incorporate the sight and sound of water to your garden, deck, patio or balcony. Light weight and durable. Can be used indoors or outdoors. Never fades or chips. Natural rock veneer. Ages like real stone. These beautifully shaped small fiberglass fountains can become a focal centerpiece for .. This decorative aquatic garden pond kit is ideal for sitting on small balconies or on a patio allowing you to bring a small pondscape closer to where you can enjoy the beauty and blooms of aquatic plants right on your patio. The Aquatic Patio Pond Kit from Aquascape is made of strong textur..
CrystalClear® Sparkle™ fountain cleaner is a revolutionary product designed specifically to keep fountains, bubblers and disappearing waterfall feature clean and clear all year long. Sparkle™ helps prevent stains, sludge, mineral deposits and organic contaminants from forming in basins. Safe for ..
Small pumps are perfect for table top fountains, spitters and stauary. Submersible fountain, waterfall and filter pump Aquascape Statuary and Fountain Pumps are perfect for running smaller decorative fountains. These high quality, mag-drive or magnetically driven water pumps are .. The Aquascape Spillway Bowl, Basin and Stand allows for an unlimited amount of installation possibilities. The Aquascape Spillway Bowl and Basin can be installed as a standalone disappearing water feature, or several spillway bowls can be linked together for an amazing display. Aquascape Spillway..
Mongolian Basalt columns are mined from the mountains found between Russia and China. Small-volume basaltic volcanism has occurred intermittently throughout central Mongolia for the past 30 million years. Aquascape Mongolian Basalt is mined, shaped and then drilled to make a stunning semi-formal .. Ideal for all container water gardens holding up to 50 gallons of water.The Aquascape Container Water Garden Filter is a complete solution for small to medium-size container water gardens or any containers with stagnant or non-moving water including birdbaths, or water containers holding spec.. These beautifully shaped small fiberglass fountains can become a focal centerpiece for a garden or backyard without the cost of real stone. These realistic garden statue fountains appear to be natural materials and weather much the same as real stone but are less expensive. The e.. The Aquascape AquaRock® Fountain Kit incorporate the sight and sound of water into your garden or home. The Aquascape AquaRock Fountain Kit is available in two colors and comes complete with everything needed to install a beautiful water fountain. The concept and design are brilliant! Everything .. There is nothing like the look of real stone to create a majestic fountain arrangement or centerpiece for your yard. Let these natural basalt columns become the centerpiece of your garden fountain display. These sets of three basalt columns are available in four different basalt variations and ea..
River Pebbles are smooth, pre-washed, polished and a perfect choice to enhance your project. Ideal choice for indoor and outdoor gardens, planters and rock gardens, flower arrangements and vases, displays and decor accents, etc. Free delivery in Canada. Easy to carry 22 lb. bags .. This is more than just a decorative urn, it is a pond filter that looks great in any backyard water garden setting! The Aquascape Pond Filter Urn is ideal for smaller ponds, including preformed ponds or container water gardens. Aquascape Pond Filter Urn can easily be incorporated into existi.. Adding pond bacteria and water treatments in ponds and water features requires regular scheduled applications for best results. A busy summer schedule and vacation time away from home can mean that treatments are forgotten or not applied at the right time. This automated doseing system delivers t.. Foam Free ™ quickly removes foam gathered on the surface of the water. The appearance of foam usually indicates the presence of an excess of protein in the water due to overfeeding and poor performance of the filter. Foam Free ™ does not remove the protein that causes the problem but it will remo..
Safely Eliminates Scale and Debris Build up from Water Features. Water Feature Maintenance will eliminate scale that will often build up in areas of the water feature that contain fast moving water. It will also prevent the build up of debris on the surface of the fountain, without the use of aci.. Keeps Birdbaths' Water Clean & Clear Specially Formulated for Birdbaths Inhabited by Birds, Small Fish, Frogs, etc. Prevents organic and inorganic contaminants from forming (i.e. crusty white scale deposits, iron, copper and hard water stains). Uses two unique proprietary technolo..
Each bottle treats up to 500 gallons. One pump per 10 gallons of water feature or fountain size. Aquascape Feature Foam Free will eliminate foam that will often build up in water features in and around fast-moving water. Keep your water features looking their very best by using Aquascape Fea..
Aquascape Fountain Scale Free™ will protect your ornamental fountain from damage caused by scale and stain buildup. Scale buildup can permanently damage water pumps and clog fountain plumbing. Aquascape Feature Scale Free does not contain harsh chemicals or acids that often damage ornamental foun..